A look of intense concentration filled Emanuele’s face as he carved the final, delicate details of a Madonna. 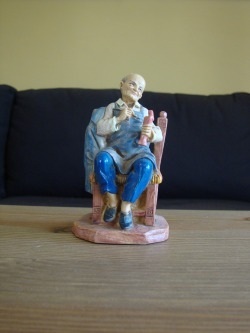 Perfecting the figurine, he relaxed and sat back in his chair to admire his handiwork. As always, completing a sculpture reminded him of the very first Nativity he carved so many years before. How he worked to save enough for his one-room shop: traveling across Europe, selling his wiggly paper mache spiders to delighted children, and learning from the masters of figurine making in every city. In the beginning it was hard work, though enjoyable. Carving the models, making the molds, pouring the plaster and painting the figurines filled the young Emanuele with happiness. When the people of Bagni di Lucca bought his figures and asked for more, he knew he was on his way to success. In time, Emanuele changed his medium to paper mache, preferring the lovely draped forms he could create. From the very beginning, a tiny spider mark adorned each figurine to remind Emanuele of the origin of his rapidly growing business. Soon his sons Mario, Ugo, and Aldo were born, and raised in the family business. With such a busy life, Emanuele treasured a rare hour or two of leisure time, often writing poetry or volunteering at the church. As it grew, the House of Fontanini employed many relatives and neighbors throughout the gentle Tuscan countryside. It made Emanuele proud to provide a living for so many families from doing the good work of creating Nativities and sacred statues. Employees were treated like family, and many returned Emanuele’s caring and concern with lifetime loyalty to his company. 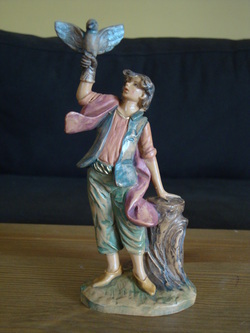 A young Luccan artist, Elio Simonetti, worked side by side with Emanuele to sculpt figures in the fashion of Fontanini. Simonetti was soon designated Master Sculptor for his amazing artistry. As the House of Fontanini expanded and time raced by, Emanuele’s grandchildren became involved in the family business too. The figurines evolved from paper mache to a new material, polymer. 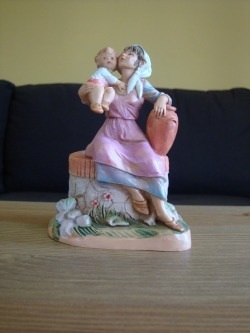 But as large as the House of Fontanini manufacturing facilities became, the process was still the same as for the first plaster figures: creating original sculptures, then molds, pouring the raw materials, then taking the molded figurines to homes nearby where local artists painted the pieces. The House of Fontanini created so many jobs over the decades that the Italian government awarded Emanuele the prestigious “Cavaliere del Lavoro” to honor him for his contribution to the economic well-being of Italy. For seven decades Emanuele Fontanini created breathtaking Nativities that inspired people all over the world with their lovely sculptures and hand-painted finishes. Thanks to his vision, the fourth generation of the Fontanini family still produces these beautifully crafted Nativities. Emanuele’s legacy will live on, every time a family places the tiny Christ Child in His manger on Christmas Eve. As Luke’s thirteenth birthday neared, excitement grew. Family custom promised a musical gift crafted by his uncles, father, and grandfather…but Luke wasn’t prepared for so grand a concertina! The gift of wood and lambskin left him speechless. Alas, the joy didn’t last. Try as he might, his sounds were far from melodious. His soul was filled with the faith of generations, but Luke was also young and impatient. Wait for God’s voice? He listened. He practiced. But time passed. Discouraged, Luke concluded the Lord’s voice would never come. He put his concertina away for good. Luke awoke one winter morning to find everyone elated about news of the Messiah’s birth…right here…behind the Bethlehem inn! The family would make a musical pilgrimage on the Sabbath. Luke’s father urged him to join in. But when everyone assembled before the Holy Family, the concertina stayed in Luke’s bag. Rather than accompany his family, the boy wandered away. Watching intently from a distance, he did not hear the footsteps. “You are not playing with the others?” the man asked, sitting beside Luke. “Do you know why you are here today, child?” the man inquired. My mother said God’s Son was born here,” Luke said obediently. “Then God is here. Right now. Why not ask Him about your music?” Luke looked at the man. His gentle eyes reassured Luke. The boy nodded and bowed his head. After his prayers, the two listened to the joyous music until Luke’s family was ready to leave. Luke’s father urged the family to move quickly so they could be home by dark. 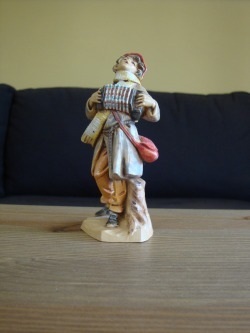 “I will play for you as we walk,” Luke said timidly, stepping to his father’s side with his concertina. Then, to the amazement of the family…but not at all to the man called Joseph standing at the stable door…a glorious song burst into the air. The boy looked up at the heavens and nodded. His melody lingered long after Luke and his family had left. The water made splashing noises as urns reached into the village well to provide the precious elixir that kept alive the village’s citizens. But the well was more than just a dispenser of life; it was the center of the community, too. Women came there to exchange news at its walls: an engagement broken; a parent’s anguish; exotic tales of traveling merchants. Among the women appearing each day was Ariel, the virtuous wife of Judah. Theirs was a joyous union, and the two wanted children from their first days together. With the seasons came fresh water to the wellspring, but despite their daily prayer no baby for Ariel. The sight of sweet infants lovingly held by mothers and grandmothers upset Ariel so much, she began to draw water in the late hours of each day, long after a child might be brought to the well. It was on such a late winter evening that she brought her urn to the silent square. Tying her jar to a sturdy length of rope, she lowered the vessel down, listening for the sound of the water. So great was her concentration that Ariel was shocked to look up from her task to find a gnarled, old woman. How frightening the woman looked! Black clothing. A face that barely peeked from the fold of her head cover. But, the words the old one spoke were sweet. “Please, my child, will you give me water? I have come very far.” Ariel’s heart beat wildly. Who was this creature? From where did she come? Sensing her fear, the stranger smiled sweetly, melting the young woman’s heart. Ariel filled the jar quickly, removed her head scarf, and bathed the woman’s face tenderly. She gave her water to drink from her hands. “I will tell you something to reward your kindness,” the wizened woman confided. “A child, unlike any other, will be born tonight in the City of David.” Ariel did not understand the old one’s comment, but gazed tenderly into her eyes. “You too will receive a gift you have long sought from God. I have come to be sure you are ready and ask that you remember me, for I am your Tikvah.” Tikvah, Ariel thought, closing her eyes. It was the word for hope. When her eyes opened a moment later the old one was gone. Ariel came to the well often over the next months. She came with the mothers and she greeted the grandmothers sweetly. But never again did she see the old woman whose late winter prophecy was indeed a gift of God. By summer’s end, a child was born to Ariel and her beloved husband. Throughout her days, Ariel knew that the spirit of the old woman dwelled at the well. Thus she brought her precious son Tikvah there each day so that they might stop a moment after their water was drawn to remember the old woman. The child born in the City of David. And God’s wondrous miracle. Eunice loved her son, Timothy, as much as she loved the Lord. 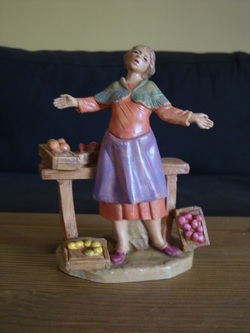 Eunice was frequently seen telling bible stories to Timothy when he was a child as they stood by her fruit and produce stand. Eunice also spent endless hours talking to other merchants and villagers about her faith in the Lord Jesus Christ. Eunice, Timothy's mother, along with Lois, her mother, followed the Lord Jesus Christ themselves. Not only were they a model for Timothy's future, they were both mentors as Timothy continued to understand and learn more about the Lord himself. The ground work for what was to become his life in following and teaching God's word was laid by Eunice and Lois when Timothy was just a boy. In his own way, Timothy also followed the same path of his mother Eunice, and his grandmother, Lois. He was a true believer of the Lord Jesus Christ, and during his adult years continued to spread the word of God to all that crossed his path. In Timothy 2:1-5, Paul the apostle wrote..."When I call, remember the genuine faith that is in you, which dwelt first in your grandmother Lois, and within your mother Eunice, and I am persuaded is in you also." What Paul saw in Timothy was the same thing he saw in Timothy's mother, Eunice, and his Grandmother, Lois. Eunice and Lois were the foundation for Timothy as he himself taught and shared stories about the Lord Jesus Christ. Albaz was a young boy who lived during the time of Jesus. Like most young boys, Albaz began to learn a trade. Normally they followed in their father's footsteps, and Albaz did the same by following in his own father's footsteps as a falconer. As Albaz began his training as a falconer, he spent a great deal of time with the shepherds as they watched over their flock of sheep. Shepherds and falconers spent endless amounts of time together in the mountains, and in the fields as they both tended to their trade. Albaz was a curious young falconer that seemed to have more questions than his father or the shepherds had answers for. When Albaz started to become more confident in his trade, he would set off on a journey, by himself into the hills with his falcon. It was at this point that Albaz started to answer some of his own questions by studying the falcon as it soared high up into the sky. Job 35:10-11 says, But no one says, 'Where is God my Maker, who gives songs in the night, who teaches us more than he teaches the beasts of the earth and makes us wiser than the birds in the sky?" Albaz thought long and hard about that question. As Albaz became a young adult, he became a master of his art. His father was very proud of him, and offered him two last bits of advice. His father told him, "Continue to learn from your falcon, and in turn your falcon will learn from you. But remember, always believe in the Lord Jesus Christ, and follow in his footsteps." Albaz, with his father's adive in mind, began to forgo the worldly possessions, and he learned that living a simple lifestyle is all he really needed to be happy. There were just a few basic things he needed in his life to be happy. Those few important things he needed were food, shelter, his falcon, and the Lord Jesus Christ. From that day forward, Albaz followed in the footsteps of Jesus with his falcon in hand. Click to view Fontanini Buildings and Accessories.